COLLEGE STATION, Texas – An 18-6 run in the first 10 minutes of the second half helped ignite an explosive Texas A&M offense, as the Aggies connected on 58.3 percent after halftime in ending Kansas State’s 5-game winning streak with a 65-53 win in the sixth annual SEC/Big 12 Challenge on Saturday afternoon at Reed Arena. Texas A&M was hot in the early going, connecting on its first four possessions, including back-to-back 3-pointers, to take a 10-6 lead into the first media timeout. The K-State defense picked up the intensity, turning over the Aggies on the next four possessions to flip the score in favor of the Wildcats, 15-11, with 11:10 remaining in the first half. Sophomore Cartier Diarra scored 4 points on back-to-back steals during the stretch. 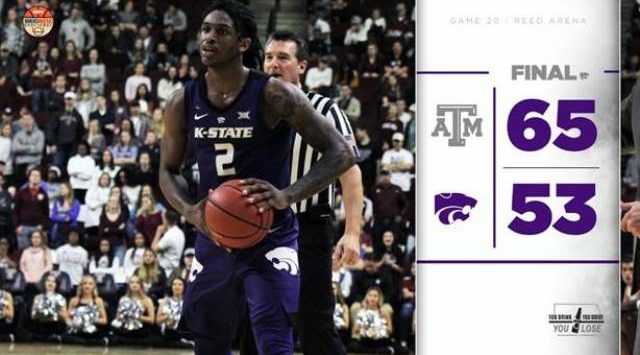 The team battled through several ties before K-State erupted for a 10-2 run, which included consecutive 3-pointers by senior Dean Wade, to take a 28-20 lead and force Texas A&M to take its first timeout with 4:42 before halftime. The Aggies responded out of the timeout to finish out the half on a 6-2 run, as the Wildcats led 30-26 at the break. The shooting percentages were nearly the same in the first half, as K-State connected on 44.4 percent (12-of-27), including 20 percent (2-of-10) from 3-point range, while Texas A&M shot 44 percent (11-of-25), including 30 percent (3-of-10) from long distance. Wade led all scorers with 12 points. Turnovers were the difference in the first half, as the Wildcats scored 17 of their 30 points off Aggies’ 11 mistakes. After Wade opened the second half with his third 3-pointer of the game, Texas A&M rattled off 7 straight points to tie the game at 33-all and force head coach Bruce Weber to call a timeout with 15:16 remaining. The Aggie run was 12-0 before Diarra ended a long Wildcat drought with a long 3-pointer to cut the deficit to 38-36 at the second media timeout with 11:59 to play. Texas A&M responded with 6 straight points to push the lead to 44-36 before jumpers by Diarra and Wade cut the deficit to 44-40 with 9:02 remaining. However, consecutive baskets, including a 3-pointer, again gave the Aggies a significant lead (49-40) at the third media timeout. Back-to-back 3-pointers by Diarra and Stokes cut the deficit to 49-46, but once again Texas A&M responded to the challenge with 7 straight points to push its lead to double digits (56-46) with 3:46 to play. The Wildcats got to within single digits after a 3-pointer from senior Kamau Stokes, but they could get no closer, as the Aggies closed out the victory from the free throw line. Texas A&M connected on 58.3 percent (14-of-24), including 50 percent (5-of-10) from 3-point range, in the second half, while K-State shot just 23.5 percent (8-of-34) from the field, including 23.8 percent (5-of-21) from long range. Junior Wendell Mitchell scored all 22 of his game-high 22 points after halftime to lead all scorers. Cartier Diarra – Sophomore Cartier Diarra provided a lift from the bench, scoring 14 points on 6-of-12 field goals, including 2-of-7 from 3-point range, to go with 4 rebounds, 3 assists and a career-tying 3 steals in 30 minutes. It marked just the fourth time this season scoring in double figures. 51 – Texas A&M became just the second opponent to shoot better than 50 percent from the field, as the Aggies connected on 51 percent (25-of-49), including 58.3 percent (14-of-24) in the second half.